CNN has debuted a refreshed “Capitol View” studio in its Washington, D.C. bureau. The space, which has seen sporadic usage over the years primarily as a flashcam studio, was completely gutted for the upgrade, which uses the same footprint but maximizes grid height and floor space. 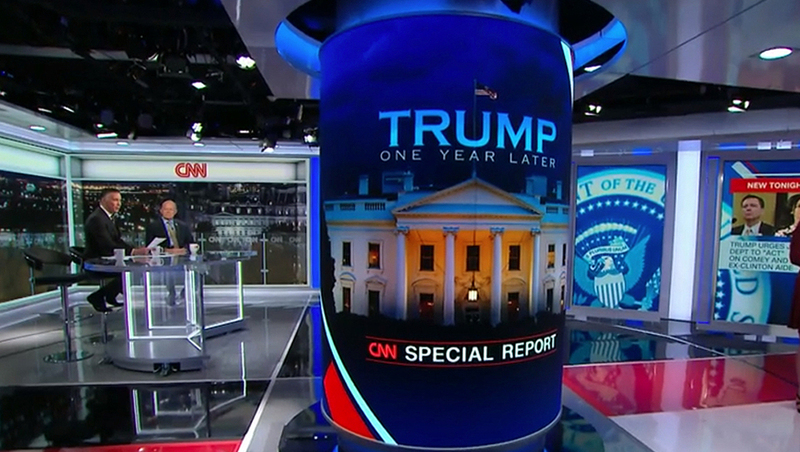 It’s now known as Studio D.
The newly updated space debuted during the network’s “Trump: One Year Later” special report and is anchored around a curved LED pillar that was used as one of the centerpieces of the special. Nearby this area are two perpendicular LED video walls from Leyard that, during the special, were used to showcase a Washington, D.C. skyline accented with faux-glass railing panels and mullions. 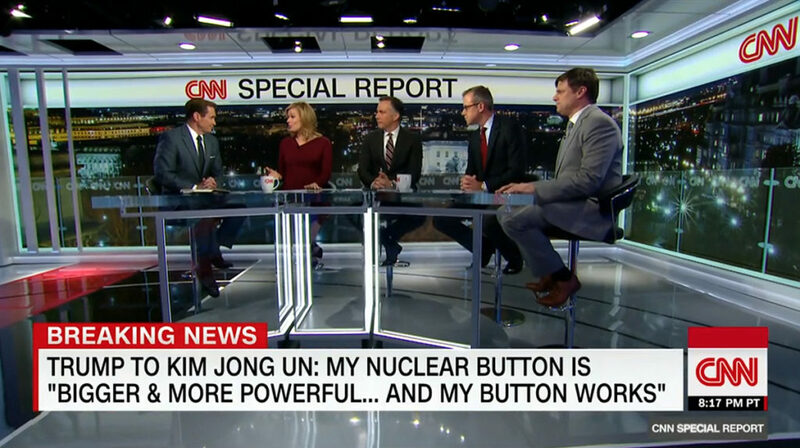 During the special, CNN used a panel-style setup in this area using a high desk with an open base accented with bright borders. On the other side of the pillar, the studio includes a backlit wall with a series of three vertical video panels that extend almost floor to ceiling, as well as an additional video panel to the far right. 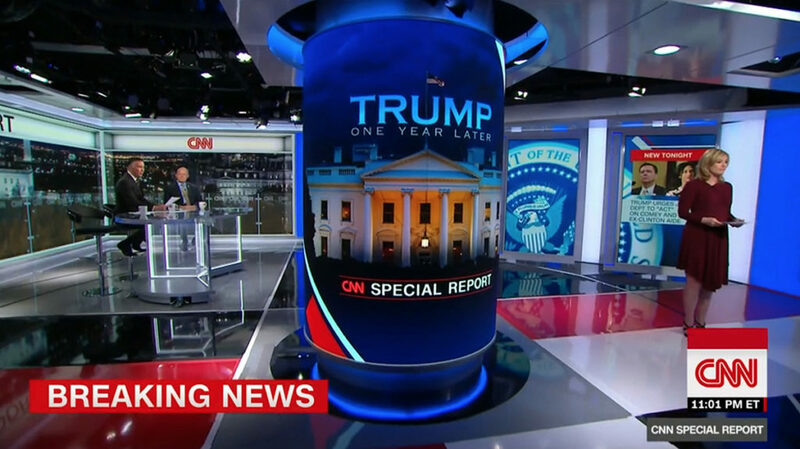 Much of the studio’s look draws inspiration from existing CNN studios, with design from Clickspring Design, including the clean and modern surfaces, a plethora of video walls, bold red floor accents and metallic header elements with cutouts. One of these header elements extends from the right side of the studio to the center, where it wraps around the video pillar. Created using a AmFlexPro P1.9 LED panel from DesignLED, the column made regular appearances in wide shots of the special, including when talent would toss from one side of the studio to the other. 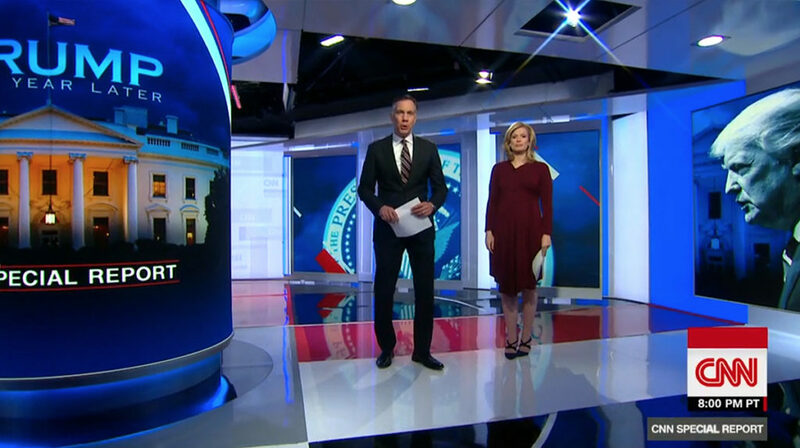 Fabrication of the new space was handled by Mystic Scenic Studios, with lighting by CNN’s Washington team led by Michelle Poley.